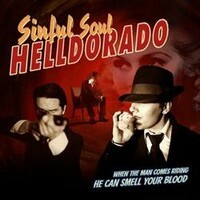 Helldorado is a Norwegian trio which combines singer / songwriter, rock / Americana and mariachi. Sinful Soul is their 3rd album and it was initially released in 2009, but only in their home country or via their website and this is the European release. They kick off with Steal Away, a slow tune with acoustic guitar and violin. When singer and guitarist Dag Sindre Vagle starts singing his vocals remind me a bit of Nick Cave... Later in the song it gets a bit heavier and with the trumpet it has a dash of Tito & Tarantula or music you know from Mexploitation. They stick to that style, but speed up a little for Your Sinful Soul. The Happiest Day is a sad rock tune, but a bit too polished - at least for me. At Cross-dressing Truck Driver they show other facets, so there are aggressive rock parts next to slow passages - spiced up with a horn section to give it the authentic touch. Sixty Seven is a good track to check out, it shows the different facets of Helldorado, even if not all. Or you check out And The Ravens Did Croak, both songs would be a good choice for a video clip... But they choose Hellraising Outlaw for a video. Bassist Hans A. Wassvik leads you into this one, a sonic roller coaster ride with angry rock parts and balladesque passages. The ballad Jump Baby, Jump isn't bad, but can't touch me... I think Helldorado are stronger when they rock. Ten Little Demons is a country rock tune and somehow they can hook you up with this one, even it isn't overly catchy. Damn You Girl is heavier and has a catchy edge.